The school day begins at 8.45 am. Parents are asked to bring their children at 8.45 am as supervision on the playground cannot be guaranteed before. To assist parents with childcare, a breakfast Club is run on a daily basis, which children can attend from 8am until the start of the school day. Following registration at 8.55am, lessons start promptly at 9am. Supervised break is from 10.30a.m. to 10.45a.m, during which time, all children may have a fruit or vegetable snack (provided by school) and milk (free up to age 5, charged thereafter if required). Morning school ends at 12.00 p.m for key stage 1, and 12.15pm for key stage 2. 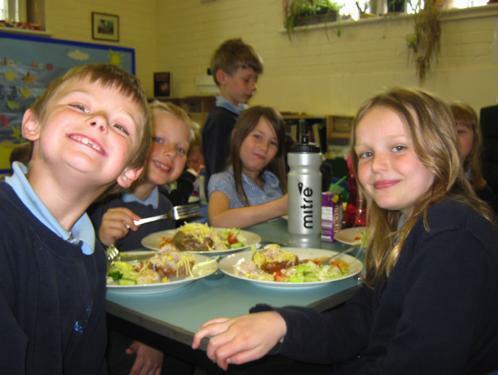 Lunch time commences at this time and children within KS1 are entitled to a free school meal. These meals are chosen by parents/carers/children from a preprinted menu and choices given (and checked) at morning registration- a copy of the menu (changes every term) can be seen on the school website under the News section / lunches. Lunch orders are also taken for KS2 pupils at morning registration. Alternatively, children are able to bring in a packed lunch, which we would request be placed in a lunch box, accompanied by a drink in a plastic flask with a secure lid. These lunchboxes are to be stored in the cloakrooms on the trolleys provided. Longborough School is a healthy eating zone where we actively discourage sweets and junk food -including sugary drinks. Please check the sugar contents of your child's lunch and discuss with your child to help establish healthy choices. When lunch is over, the children are responsible, under supervision, for clearing tables and returning the classroom and/or hall to its normal state. Following lunch, children are able to play for the remainder of their lunch hour under supervision of our Midday Supervisors. The school day ends at 3.20pm for all pupils. A range of school clubs are run throughout the year until 4.15pm and a fun after school Club is also run on a daily basis to 5.00pm. Morning Session Starts 8.55 a.m 8.55 a.m. Morning Session Ends 12.00 p.m. 12.15 p.m. Afternoon Session Starts 1.00 p.m. 1.15 p.m. Afternoon Session Ends 3.20 p.m. 3.20 p.m.